As we all know, letting your PA book your flights is a gruesome process in the beginning. Finding out that you have to cancel your morning run to make it on time for the morning transatlantic flight is bad enough. But not realising until reaching the airport that you are intended to fly Delta is an experience I wouldn’t wish upon my worst enemy. Sure, everyone has to learn, but that knowledge as elementary as airline quality isn’t taught in schools is nothing less than an insult to modern society. Only a layman chooses airline based on destination. Nevertheless, to make yet another contribution to society, we hereby present the tier one airlines from the Middle East. Perfect when visiting the next edition of the IDEX Arms Bazaar in Abu Dhabi, stopping by Doha for some caviar at Al Shaheen, or – god forbid – passing through Dubai for a (hopefully) quick transfer. Sheikh Khalifa bin Zayed Al Nahyan certainly has an excellent choice in airlines. The Abu Dhabi Sheikh not only hosts specially recruited Food and Beverage Managers for each flight, but the Diamond First Class non-stop to JFK is divine. We’re especially excited about the upcoming A350-1000s which will be a nice addition to this sweet Middle Eastern aviation gem. The post-flight nightmare is easily handled by the charming staff at The Premium Terminal at Doha International. As Tyler noted, that new line of 777s is also well awaited. Doha is literally overfull with business men waiting to get a smooth departure to Barcelona, Taipei or Oslo. For the record, did I fly on Concorde many times? Absolutely. As the second of our two high notes from last years aviation tradeshow, EBACE, comes HondaJet (HA-420). This is an aircraft with exquisite finish and a manga inspired design, clearly representing the attention to detail that always defines Japanese products. After almost 10 years of preparation it made an astonishing debut a year earlier (with over 100 orders placed in the first three days) and was certainly in the spotlight at last years fair. We’re always looking for the next innovation within transportation and mobility. Coming from motorcycles it’s natural for us to go into the air. European countries are also best fit for this kind of aircraft, since Europeans are more environmentally conscious. This is a low noise, low emission and high fuel efficiency aircraft which should be attractive for european customers. As the premium airline experience becomes less attractive and more aircrafts come to market around the one million euro price range the worlds biggest carriers will continue to lose their top passengers as they opt to go private. Will HondaJet be their first choice? It’s definitely an option to seriously consider when your searching for a fast and easy transportation to get to your favourite cottage in the alps or a weekend at The Pellicano Hotel in Tuscany. As we are packing our Porter bags for one of the highlights of this season, the annual aviation tradeshow EBACE in Geneva, it seems appropriate to take a closer look on the private aviation market. We will be looking into two of the high notes from last year’s show. First out is Pilatus Aircraft’s PC-12. The PC-12 is to private aviation what the Range Rover is to manicured graveled highways in the Hamptons – luxurious but with the butch credentials of an aircraft used by the RCMP and the Australian flying doctors. I thought I needed the speed of a jet. But flying the PC-12 down to our home in Florida, with 5 or 6 of our friends, we would all have more room, we’d spend a lot less money getting there, and we’d arrive only minutes later than the jet. That’s because the jet has to stop for fuel, and we don’t, since the PC-12 delivers far more range. This surely makes the PC-12 a strong contender for our next aviation purchase. 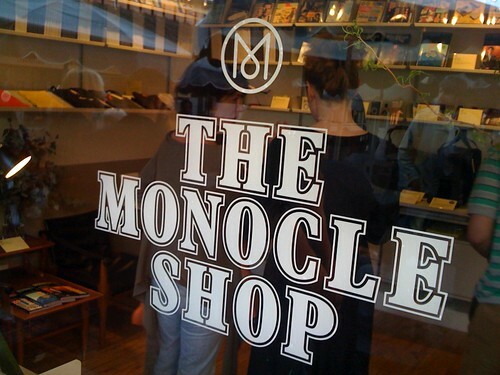 Monocle just opened a small boutique in Brentwood, Los Angeles. To settle the locals´ curiosity, our man decided to do an interview for LAist.com. Although being completely honest and fair in his answers (24 hours is perfectly sufficient for any possible needs in the city), the readers have little understanding of the critique. One reader even goes as far as calling Tyler a “d-bag”, and we assume that he isn’t referring to an upcoming line from Porter. It is simple. As stated in the interview, what Los Angeles needs is a substantial increase in bikeability. Nothing to get too distressed about. This bag is small enough to meet all hand-luggage regulations – it will easily fit into an overhead cabin or under an A320 seat – yet, with a bit of smart packing, could contain enough to last you a week or more. Also, includes a laundry bag, a pouch for toiletries and pouch to store a bag when you get back to your pied-à-terre. The plan involved having our Swiss colleague take the wallet to Zurich where he would be met by our new intern Jonathan, who was dispatched from London to deliver the wallet to Paris. While some very high winds almost delayed his flight’s approach to Zurich, Jonathan eventually made it to the small cocktail party we were hosting on Rue Royale with enough time to knock back a glass of champagne before we had to leave. I’m kicking myself because I didn’t think of that. Is Tyler Brûlé for real? Sir, As a previous correspondent once asked, Is Tyler Brûlé for real? He is editor-in-chief of Monocle, a publication so exclusive I have never seen it advertised, nor on sale. He seems to spend most of his time flying long distances on business (and in business class) or on holiday, presumably performing many of his editorial duties en route. He is based in London, but at the same time he also owns an island (complete with house and jetty) in Sweden for summer use and a flat in St Moritz for winters, yet is now looking for further accommodation in the Mediterranean area to enable him to enjoy “true winter sun” (“Great escapes in mind”, House & Home, January 3/4). Apart from the last, it sounds an enviable lifestyle. How does Tyler Brûlé do it? A valid question, Mr Fletcher. Is Tyler Brûlé for real? And if so, how does he do it? It’s questions like these that we will attempt to answer in this publication. See it as a guide – a tribute. And a laugh. 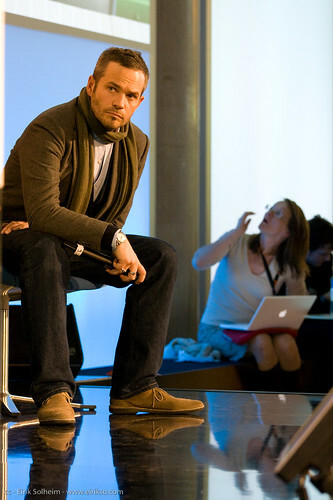 April 25th, 2009 | Tyler Brûlé | Tags: financial times, introduction | Comments Off on Is Tyler Brûlé for real?